We spent our last night at Lake Como at a small pizza shop in the town of Tremezzo called Pizza Balognett. 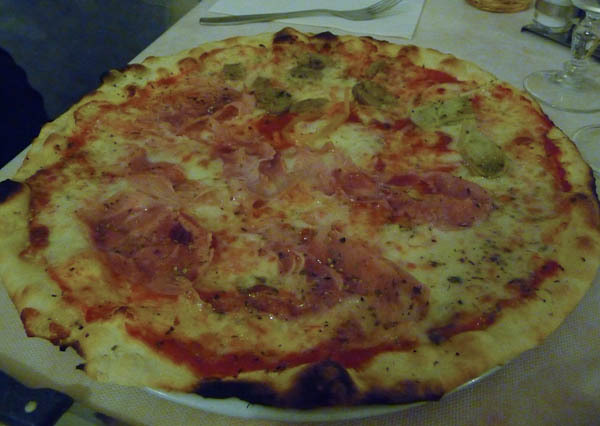 This was hands-down the best pizza we’d ever eaten in Italy. We weren’t very hungry but we ended up eating two pizzas. This was the first – a four seasons pizza with a different ingredient in each quarter. The second was gorgonzola and pear. The crust was heavenly thin. We would go back to Lake Como just to go here again. At the end of the meal we were the last ones left in the restaurant and spent about 30 minutes talking to the owners. It was one of those times you never forget. No comments yet. Use the form below to be the first.